The first part of Holy Week presents us with an array of themes based chiefly on the last day's of Jesus' earthly life. "The story of the Passion, as told and recorded by the Evangelists, is preceded by a series of incidents located in Jerusalem and a collection of parables, sayings and discourses centered on Jesus' divine sonship, the Kingdom of God, the Parousia, and Jesus' castigation of the hypocrisy and dark motives of the religious leaders." 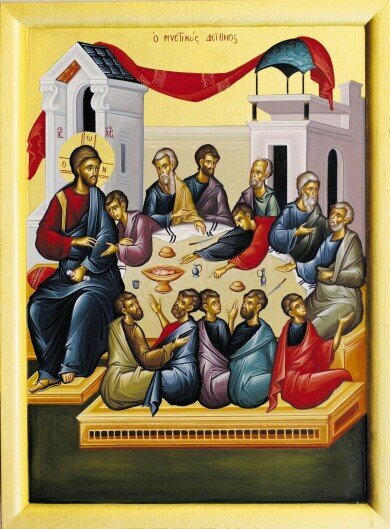 The Orthros Services of Holy Monday, Tuesday and Wednesday is called the Service of the Bridegroom, and gets its name from the central figure in the well-known parable of the Ten Virgins (Matthew 25.1-13). "The title Bridegroom suggests the intimacy of love. It is not without significance that the Kingdom of God is compared to a bridal feast and a bridal chamber. The Christ of the Passion is the Divine Bridegroom of the Church. The imagery connotes the final union of the Lover and the beloved. The title Bridegroom also suggest the Parousia. Each day of Holy Week has its own particular theme. The theme of Monday (celebrated in anticipation on Palm Sunday evening) is that of the barren fig tree (Matthew 21: 18-20) which yields no fruit and is condemned. On Tuesday (celebrated Monday evening) the theme is on the vigilance of the wise virgins (Matthew 25: 1-13) who, unlike their foolish sisters, were ready when the Lord came to them. On Wednesday (celebrated Tuesday evening) the focus is on the sinful woman (Matthew 26: 6-13) who repents. Great emphasis is made in the liturgical services to compare the woman, a sinful harlot who is saved, to Judas, a chosen apostle who is lost. The one gives her wealth to Christ and kisses his feet; the other betrays Christ for money with a kiss. Make a point to attend services with your children. Make time to read the "theme" gospel lessons before coming to services, since they are not part of the Gospel reading, but only referred to during the service. Speak with your children about Christ's second coming, ie. that "He will come again" as we recite in the Nicene Creed. Jesus reminds us during the first three days of Holy Week, as was done on many occasions during Lent, that we must be watchful and repent while there is still time. Behold, the Bridegroom sets forth in the dead of night. And blessed is that servant whom he shall find on watch; unworthy the one he shall come upon lazing. See to it, soul, that sleep does not overtake you, lest you be given up to death and be shut out of the kingdom. Bestir yourself, then, and sing out: “Holy, holy, holy are You, our God; through the prayers of the Theotokos, save us. Loving God, the woman taken in sin approached You, pouring out on Your feet myrrh mixed with tears, and at Your word she is rid of the odiousness of her acts. But the disciple, lacking all grace, though he lived by Your grace, rejects it and covers himself in mire, selling You out for greed. Glory to Your forbearance, O Christ. On Wednesday in Holy Week the Holy Fathers have decreed the commemoration of the sinful woman who anointed the Lord with myrrh, as this occurred shortly before His saving Passion. A woman pouring myrrh over Christ’s body anticipated the embalming by Nicodemus. Anointed with spiritual myrrh, Christ God, free us from passions that overwhelm, and be merciful to us as the One who alone is holy and loves humankind. Amen. The harlot blended priceless myrrh with tears, and poured it over Your immaculate feet as she kissed them. Her You justified at once; will You likewise grant us forgiveness, Who suffered for us, and save us? Oh, the wretchedness of Judas! As he watched the sinful woman kissing Your feet, he cunningly plotted the kiss of betrayal. As she unbound her tresses, he was bound by his anger, bearing foul wickedness instead of myrrh. For reason does not know enough to seek what is best. Oh, the wretchedness of Judas! Deliver us from it, O God. The harlot spread out her hair for You the Master; Judas spread out his hand toward the wicked: she to gain pardon, he to gain silver. And so we cry out to You, sold for our freedom, Lord, glory to You.